Getting ready for the first day of Kindergarten is an exciting time for both students and families. To help families prepare for Kindergarten and to allow the District to plan for the upcoming school year, all elementary schools host the annual Kindergarten Round Up for incoming Kindergarten students. 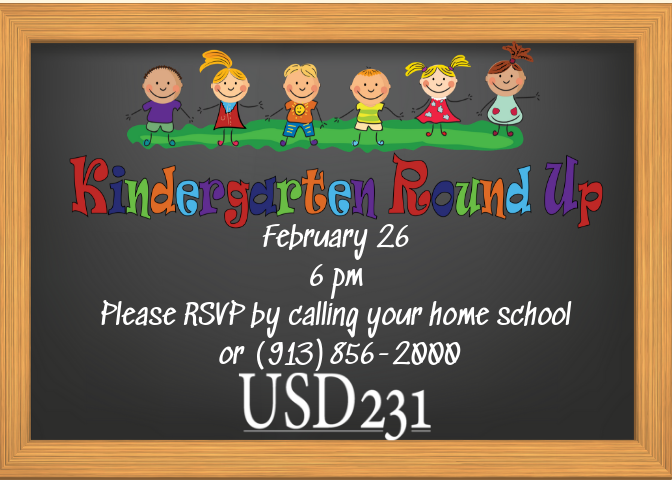 Kindergarten Round Up this year will be held at 6 p.m. on Tuesday, February 26, at each elementary school. To be eligible for Kindergarten in the Gardner Edgerton School District, children must be 5 years old on or before Aug. 31. Entering kindergarten requires a state issued birth certificate, official record of ALL required immunizations (list of immunizations can be found here), and a physical. Below are the District elementary schools and phone numbers. Please call your child’s school to make a reservation or visit www.usd231.com and select the appropriate school page under “schools” and then complete the kindergarten survey on their page. If you are not sure of the school your child will be attending, please visit the “School Locator” Link. Gardner Edgerton School District Kindergarten programs focus on a nurturing environment which provides for both academic and social growth while allowing children to begin to develop personal responsibility and independence.